The flight into the stock market at its core represents simple logic, the simplicity of which tends to be overlooked by over-complicating diatribe regurgitating economists and journalists who tend to attribute the rally to relief that the Cyprus crisis is not as bad as it could have been, instead the simple logic is that if investors with funds parked in banks are at the real risk of losing as much as 40% their funds in exchange for a pittance in interest of usually less than 3% per annum (less than Inflation after tax). Then is it not simple logic that dictates that investors should pull their funds out of the banks and park them in SAFER dividend paying blue chip stocks that despite having a similar downside risk i.e. 40% potential loss if the markets crashed, but in exchange for that risk is an dividend income that INCREASES each year PLUS potential of capital gains of probably between 20% to 50% per annum (depending on the individual stocks performance). 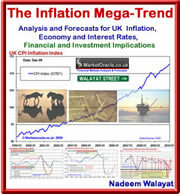 This is the reason why I have been advocating heavy stock market exposure (25%) over cash or bonds for several years well before the crooks at the Central Bank of Cyprus decided to steal depositor funds as illustrated by the Inflation Mega-trend ebook of Jan 2010 (FREE DOWNLOAD) , because depositor funds have already been stolen in the UK and USA by means of stealth i.e. high inflation which GAURANTEES to steal your wealth to the tune of 40% per decade as the following graph illustrates as to the approx 14% stolen from UK bank depositors over the past few years. Therefore the theft of bank deposits in Cyprus is not that different to that which the UK and US have been engaged in a more stealthy manner as we too will also lose at least 40% of the value of our bank deposits, it's just that our savings will be stolen over a decade rather than over a few weeks. The Cyprus crisis has firmly focused the minds of all savers to the truth that their bank deposits are being systematically stolen by all governments which is starting to significantly result in a change of investor / depositor behaviour as they can clearly see that the stock market now represents LESS risk over even the short-term never mind the long-run than depositing money in the banks! My last in depth analysis and concluding trend forecast as iterated in the Stocks Stealth Bull market ebook of Feb 2013 (FREE DOWNLOAD), expected that whilst the bull market will continue for many years i.e. I had penciled in a potential for Dow trading as high as 20,000 during 2017. Nevertheless probability favours a significant correction this year into mid summer that was expected to begin by mid March, instead the impact of the Cyprus theft of deposits crisis has been to extend the rally as scared depositors are seeking a long-term lower risk safe havens that can be found in blue chip dividend increasing stocks far beyond anything that they would have perceived of in terms of risk just weeks before. My overall strategy remains as I voiced in the my last ebook which is to reduce my net long exposure to the stock market ahead of a significant correction as the rally continues i.e. as of writing I have approx 16% of my assets now invested (net long) in the stock market as I continue to take opportunities to bank profits. Whilst I could take the time to analyse the stock market at greater extent again, however, I doubt that the conclusion would result in any significant change of this strategy, so instead my focus is on compiling a list of stocks and commodities to accumulate into as opportunities arise. The primary sectors that I am focusing on right now being bio-technology and Graphene, and where commodities are concerned as I suggested in December 2012 (Gold Price Forecast 2013, Buying Opportunity?, is Silver Cheaper? ) I am converging towards significantly expanding my Silver position the analysis towards which I will probably next seek to convert into an article. If you have been reading my most recently articles you will know that my Financial Armageddon protection plan had triggered a transference of funds out of high risk euro-zone banks to lower risk wholly UK banks, as I still hold approx 1/3rd of my assets in cash and bonds. 24 Mar 2013 - Cyprus Bankruptcy Contagion Financial Armageddon Risk, Santander Down for Maintenance? In which respect Santander (as a legacy account holder following the take over of Alliance and Leicester) continues cling on to my funds with tips of their finger nails, this despite having jumped through several hoops, including visiting a local branch in Sheffield with ID, they still failed to carry through on withdrawal requests. This despite ms-leading me at the branch that online account access had been restored and that the funds had been transferred some 3 days ago! To be blunt - I have NO trust in Santander Bank, and as the log-in screen suggests rather than requesting that I call a number to unblock online access or even a snail mail letter, instead Santander puts up a ms-leading delaying maintenance page that is still there some 9 days on! Or worse an "Internal Server Error". Yes, Cyprus has triggered "Internal Server Error's" for the whole of Europe's banking system. Be warned an "Internal Server Error" coming soon to a bank near you! 31 Mar 13, 13:56 Same Strategy. Same chart forecast? Thank you once again for another interesting article. When you say your strategy hasn’t changed, I gather your thoughts on the correction haven’t changed either? And in more particular, the suggested path of the correction as is shown in Stock Market Forecast 2013 Chart above? My investment decisions are guided by risk vs reward rather than forecasts which can always only be rough road maps. For instance when the Dow was at 11k the rewards far out weight the risks, in terms of subsquent trend, but with the Dow at 14,600 the risks significantly outweigh the rewards i.e. there is a greater probability for a 20% drop then a 20% rise going forward.